Ribeye, also known as the Scotch fillet (in Australia and New Zealand), is a beef steak from the beef rib. The most popular cut of beef steak, a rib-eye is cut from the rib meat of a cow and can be boneless or left with the bone, depending on preference. The marbling of fat found in a rib-eye yields a tender and juicy steak after cooking, which some argue is increased by the additional fat and moisture provided by the bone if a bone-in cut is chosen. Colors: Red and marbled with white fat, rich brown after cooking. Wine complements: Petite sirah, Cabernet sauvignon, Bordeaux. Substitutes: Eye of round is a common, But not preferable substitute. Choosing: Choose a rib-eye steak that is bright red in color with visible marbling. A steak labeled as "prime" will be more costly, but will have superior marbling and yield a more tender steak. Cuts labeled "choice" are also very good although leaner and will be excellent grilled. While choosing beef from an Angus cow is popular, it does not necessarily impact the quality of the steak. Whether to choose a steak that is bone-in or not is a matter of personal preference, though the bone will increase the overall weight and cost of the rib-eye. Buying: Rib-eye steak cuts can be found in nearly any grocery store's meat section due to its overwhelming popularity. However, butchers and small meat markets will likely have a greater overall variety of quality and often has fresher product. For the best flavor, choose from beef that has been grass-fed and free range, which also produces a more tender meat. The most popular way to prepare rib-eye steak is to grill over an open flame, though using a cast-iron skillet on stove top is also acceptable. Cooking time is dependent on the desired level of tenderness, with a "rare" steak describing meat that is still pink and tender through the interior, while "well-done" refers to being cooked throughout, leaving the steak firm and brown in the center. Medium-rare is the most commonly preferred level. Cleaning: Rib-eye steak is cut ready to prepare, with no additional trimming needed. Be certain to thoroughly wash any surfaces the raw meat comes into contact with, including your hands, to avoid the spread of possible bacteria. 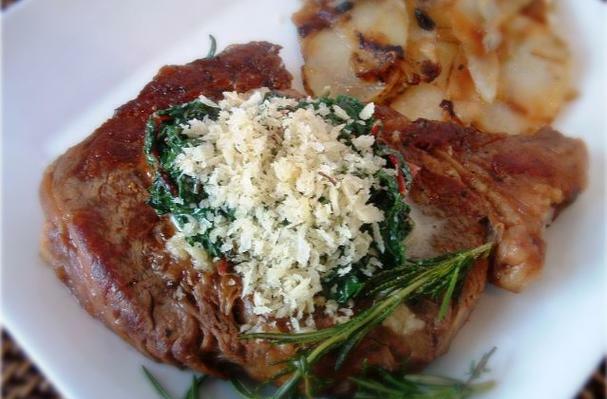 It is ideal to consume a rib-eye within one to three days after purchase. Store in the refrigerator in its packaging until ready to prepare. If desired, the raw steak may be frozen and kept in the freezer for up to 6 to 12 months, then thawed in the refrigerator 12 to 24 hours before preparation. After being prepared, immediately refrigerate any leftovers and consume within one to three days.